My name is Drood, Eddie Drood, aka Shaman Bond. For generations my family has protected you ordinary mortals against things that lurk in the darkness, just out of sight, but not at all out of mind. Unfortunately, I've had a falling-out with my near and dear (some of whom were trying to kill me), so my true love and powerful witch, Molly Metcalf, and I are now in the employ of the Department of the Uncanny. 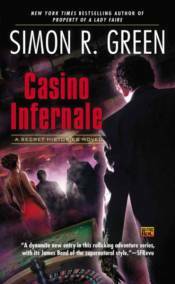 We've been given an Extremely Important Assignment: Attend Casino Infernale, an annual event held by the Shadow Bank, financiers of all global supernatural crime. Our mission: Rig the game and bring down the Shadow Bank.